The popular belief among scientists regarding human essence is that human being is a rational animal. To them, rationality means having the theoretical intellect, i.e. the potential to think and to conceive universal concepts. Therefore, according to the popular viewpoint, man is a rational animal who is able to think. The aim of this article is to prove that the belief in God and having the relationship with Him is a constitutive element of humanity, moreover, the ability of thinking and of conceiving universal concepts. This will be explained by reason and Qur'anic verses in this writing.Therefore, not only having theoretical reason but also having practical reason is the constitutive element of humanity. Whoever follows the practical reason does good deeds. The requirement of doing good action is having the intention of being closed to God. Similarly, humanity is a hierarchical and fluid fact. Therefore, the essences of human beings are different.The validity of the result of this paper will be clear in using this theory in human rights discussions. ابن­سینا، حسین (1405)، الشفاء، المنطق، قم: مکتبة آیةالله المرعشی النجفی، ج1. 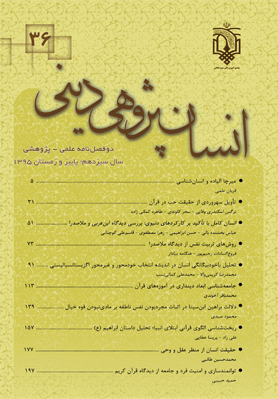 جرجانی، سید شریف (1304)، (الحاشیة علی) شرح الشمسیة، تهران: کتاب­فروشی علمیه اسلامیه. صدرالدین شیرازی، محمد (1381)، المبدأ و المعاد، تهران: بنیاد حکمت اسلامی صدرا، ج2. طالبی، محمدحسین؛ طالبی، علی (1392)، «ترادف علوم انسانی با علوم انسان­ساز»، در: معرفت فلسفی، ش41، ص157-178. عبودیت، عبدالرسول (1391)، درآمدی به نظام حکمت صدرایی، تهران و قم: سازمان مطالعه و تدوین کتب علوم انسانی دانشگاه­ها (سمت)، مرکز تحقیق و توسعه علوم انسانی، و مؤسسه آموزشی و پژوهشی امام خمینی (ره)، ج3. کلینی، محمد بن یعقوب (1364)، اصول کافی، تهران: انتشارات علمیه اسلامیه، چاپ چهارم، ج1. مجلسی، محمدباقر (1404)، بحار الأنوار، بیروت: مؤسسة الوفاء، ج2. Staley, Kevin (1993), “New Natural Law, Old Natural Law or The Same Natural Law?”, in: American Journal of Jurisprudence, No. 38, pp. 109-131.